Ross Hancock sold his four-bedroom house in Coral Gables, a city of pastel luxury at the edge of Miami, because he was worried that sea-level rise would eventually hurt his property’s value. He and his wife, Darlene, downsized to a small condo on Biscayne Bay, perched atop one of the highest coral ridges in the area. There, he presumed, they would be safer. The September storm pushed water onshore with such force that it penetrated the seams of Hancock’s building, defeating stormproof windows and damaging a third of the units. It knocked out the elevators, ruined the generator, and flooded the parking lot. Months later the park next door remains strewn with mangled yachts hurled from from the ocean. Hancock’s unit was spared, but he’s facing a $60,000 bill from the condo association for his share of what insurance won’t cover. Now, four years after leaving Coral Gables, he and his wife want to move again—this time, out of Florida. But more than two months after listing their property, they haven’t found a buyer. Decisions by people such as Hancock to sell their homes demonstrate that one of the great mysteries of climate change isn’t scientific but psychological: When will the growing risks associated with rising seas and more severe storms begin to affect home values in otherwise desirable coastal markets? Nowhere is that question more pressing than South Florida, which has some of the country’s priciest properties—and some of the most vulnerable. A state built on real estate speculation, whose chief attribute was proximity to the water, now faces a whole new problem: There’s not enough land, high enough above the water, for its residents to pull back from the rising seas. By the end of the century, database company Zillow Group estimates, almost a half-million Miami homes could be—literally—underwater. That’s more than anywhere else in the country. In a working paper posted this month on Social Science Research Network, an online repository of academic research, professors from the University of Colorado at Boulder and Pennsylvania State University found that homes exposed to sea-level rise sell at a 7 percent discount compared with equivalent but unexposed properties. 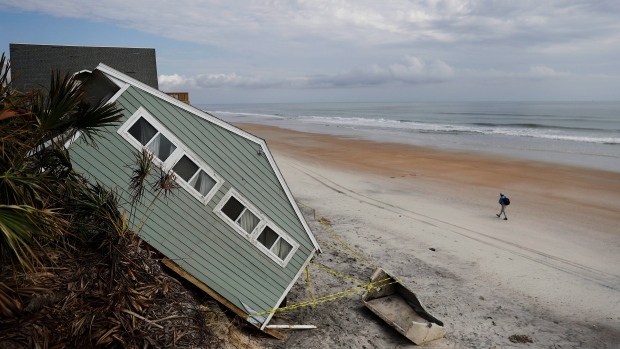 “This discount has grown over time,” the authors wrote, “and is driven by sophisticated buyers and communities worried about global warming.” Properties along both coasts of Florida are at risk of sea-level rise, mapping in the paper shows. Marla Martin, a spokeswoman for Florida Realtors, which represents the state’s real estate agents, wasn’t available to comment. Irma smashed through the Caribbean as a Category 5 hurricane, then weakened before hitting Florida on Sept. 10. With winds topping 100 miles per hour, the storm caused billions of dollars of damage to homes, utilities, and citrus crops. It’s too soon to know how Irma affected the market, says Aaron Terrazas, a senior economist at Zillow. But there’s anecdotal evidence that it’s taking a toll on property values: A company that assesses flood risks is booming, and workshops for municipal leaders to deal with the impact are drawing sold-out crowds. Before the storm, Bloomberg reported about the concerns of homeowners, local officials, business executives, and housing lenders that South Florida’s real estate downturn could be closer than many people realize. This month we checked in with some of the people featured in that story, to find out how Irma affected them—and what their experiences augur for the future of the real estate market in Florida and other coastal areas. One of those people is Albert Slap, who would rather not be profiting from other people’s misfortune. But his business, determining the flood risk facing specific homes around South Florida, has never been better. And he thanks Irma. What’s good for Slap isn’t necessarily good for the region’s property values. His customers include insurance companies worried that federal flood maps underestimate risk, as well as potential homebuyers trying to find out if they’re about to buy a house that will be regularly inundated by South Florida’s increasingly troublesome tidal flooding. The region’s frothy home values, Slap said, have persisted because of what he calls “a dirty little secret” among real estate agents, who are aware of the flood risks but face no requirement to disclose them to buyers. Slap said the increase in his business shows that buyers are starting to become more aware of the problem—and as that happens, housing values will fall. And he said it’s only a matter of time before real estate agents are required by law to reveal those flood risks, noting that the U.S. House of Representatives passed a bill to that effect in 2017. The Senate has yet to take it up. But it’s not hurricanes that have Kipnis worried about the local real estate market. Rather, it’s the seemingly endless construction—elevating roads, installing new stormwater drains, and other projects—designed to lessen the impact of sea-level rise. And then there are the property taxes required to pay for all that work: Miami Beach’s plans are set to cost as much as $500 million. The noise and inconvenience of that work pushed Kipnis to try to sell his house. But he worries that the same things which make him want to leave are also scaring off buyers. After 18 months on the market, and despite dropping the price by more than one-third from $3.2 million, Kipnis still hasn’t sold his home. When Jim Cason first became mayor of Coral Gables in 2011, he sometimes felt like a lonely voice, warning about sea-level rise and what it could mean for South Florida’s real estate market. He argued for then-radical ideas, such as the need for cities to set aside money now to pay for the eventual demolition of homes inundated with water and then abandoned.